THE NEW EU NOW PUSHING ITS LISBON TREATY: MEMBER STATES ARE NO LONGER SOVEREIGN……. – The Tundra Tabloids……. when we rammed through the Lisbon Treaty? Telegraph: Joao Vale de Almeida was this week formally installed as the EU’s ambassador to the US, and suggested that American officials should regard him as their first point of contact for transatlantic discussions. 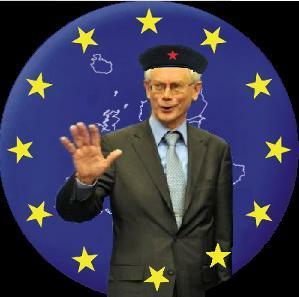 He is the first EU ambassador to be appointed after the controversial Lisbon Treaty gave the EU sweeping new powers. The new ambassador claimed to now be “leading the show” among European representatives in Washington. The prospect of an EU official speaking for the UK to its most important ally has angered eurosceptics, who said it shows Britain’s waning influence. Mr Vale de Almeida’s comments are also likely to alarm Sir Nigel Sheinwald, the British ambassador in Washington. Sir Nigel is thought to have struggled to build strong relations with the White House after a memorandum he wrote for Gordon Brown questioning Barack Obama’s experience was leaked in 2008. The Lisbon Treaty took force last year, taking the EU another step closer towards acting as a single entity in international affairs. The treaty created a European president and foreign minister and gave EU diplomats new powers to speak for all 27 union members on many issues. Previous Post Previous Post JEWISH EDL MEMBER INTERVIEWED BY THE HAARETZ……. Next Post Next Post COPTIC PRIEST WITH 60 MILLION DOLLAR FATWA ON HIS HEAD IN CANADA FOR SEMINAR…….